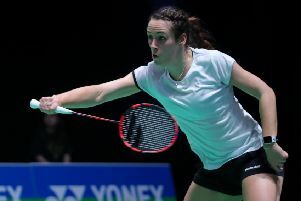 Chloe Birch proved one of the heroes of England’s run to the bronze medal in the team event, and now the badminton ace is ready to branch out on her own on the Gold Coast. Preston's Birch went unbeaten through the group stages and quarter-final against Canada to help set up a team semi-final against Malaysia. There she suffered a narrow loss to Soniia Cheah – the fifth seed for the women's singles – in three close sets. But England bounced back to take bronze on Monday with a straight-forward victory over Singapore and give the 22-year-old Birch her first-ever Commonwealth medal. “We came in here expecting a medal, and Singapore put up a real fight in the bronze medal playoff but everyone dug really deep,” she said. Birch will now have a free shot in the women’s singles draw with little pressure on her. Ranked down at 63 in the world, Birch has been playing well above that level here on the Gold Coast and will kick off her campaign for individual glory against Johanita Scholtz of South Africa in the early hours on Tuesday morning. And there is plenty of cause for optimism considering the two have already met in the team event and Birch proved far too strong, dispatching the 18-year-old South African 21-10, 21-10. “I am really excited for the individual, I actually feel quite fresh unbelievably,” added the Lancashire star. Birch has been hailed by her teammates as the gutsiest player in the team, and her in-your-face style has kept the England bandwagon rolling in the second week in Australia. “It is really nice to know that, I always get stuck in when I go on court and I have probably played some of my best badminton here,” she added.